Six months ago, President Barack Obama announced several actions to improve America’s immigration system, including a program dubbed Deferred Action for Parents of Americans and Lawful Permanent Residents, or DAPA. The U.S. Citizenship and Immigration Services, or USCIS, were scheduled to begin the implementation of DAPA today. This program would provide temporary relief from deportation and work authorization on a case-by-case basis to parents of U.S. citizens and legal permanent residents who have been in the country for at least five years. The president also increased the age limit to qualify for Deferred Action for Childhood Arrivals, or DACA—a program that protects undocumented individuals who entered the country at a young age, known as DREAMERs. However, the implementation of DAPA has been blocked instead. In response to a lawsuit brought by Texas and other states, an ideologically motivated judge from one of the most conservative circuit courts in the country issued a preliminary injunction against DAPA. Today, in response to this deadlock, a coalition of faith, labor, business, and community groups will join public officials to demand an end to the lawsuit blocking the implementation of DAPA and DACA expansion, allowing the programs to move forward. In addition to conservative opposition in the courts, congressional votes to terminate both DACA and DAPA have overwhelmingly split along party lines—with Republicans trying to block these programs, while Democrats seek to preserve them. Those who oppose DAPA are ignoring the signifiant fiscal and economic benefits the program offers, as well as key electoral implications that have the potential to play a significant role in upcoming elections. Implementing DAPA is not only the right thing to do for families and the economy—it also has key electoral implications. Reflective of the overall immigrant population, potential DAPA recipients are largely Latino and Asian immigrants along with a smaller but growing African immigrant population. Opponents of DAPA will likely alienate a critical and growing voting demographic within the United States while champions of the program are likely to engender significant support from these same voters. 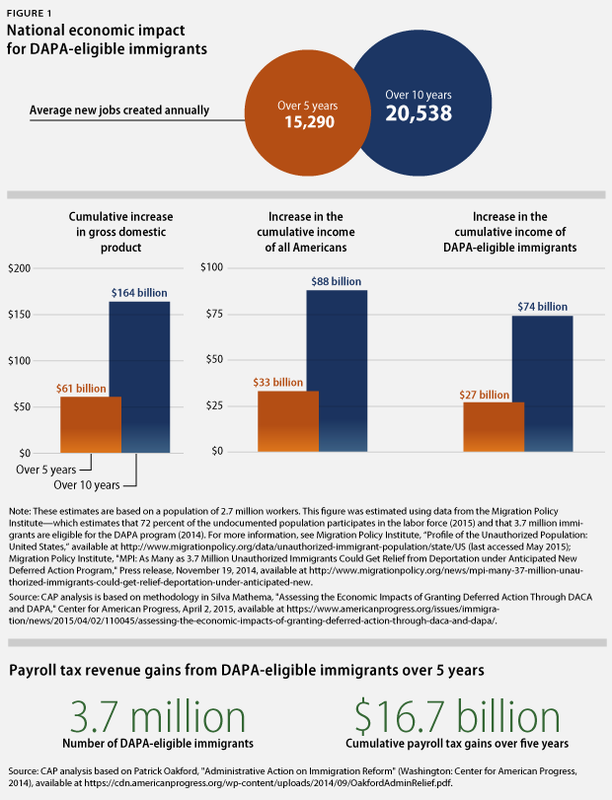 There are 3.7 million individuals who would benefit from DAPA. Combined, these individuals have 5.5 million U.S. citizen children—all of whom already are or will eventually become eligible to vote. If DAPA were implemented, these 5.5 million individuals would no longer have to fear that their parents could be detained or deported at any time. More than half a million of these children—nearly 600,000—are currently of voting age, and 1.7 million will be of voting age by the 2020 presidential election. These numbers could provide sizable contributions to the margin of victory in swing states. In Florida during the 2012 presidential election, for example, these new voters would have comprised 70 percent of the margin of victory; in North Carolina, they would have represented one-third of the margin of victory. These figures do not take into account other citizen members of “mixed-status” households that include DAPA-eligible individuals—voters who would also feel the effect of DAPA implementation. Demographers and electoral analysts know a lot about the electoral demographics of the Latino and Asian populations, and their voting power is felt—and will continue to be felt—across generations. In 2016, the voting eligible population will be 13 percent Latino and 7 percent Asian. Every month, nearly 69,000 Latinos and 16,000 Asian Americans turn 18 years old, resulting in more than 4 million new voters combined between 2012 and 2016. 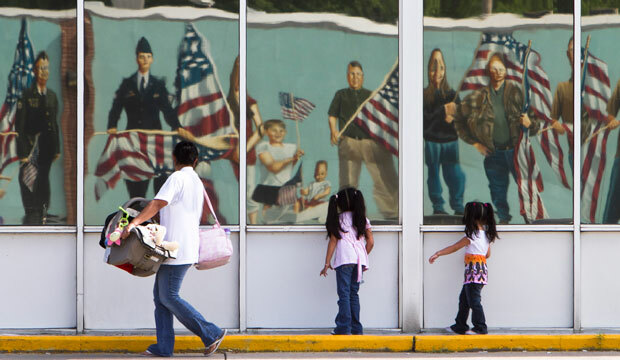 Of the new Latino voters, nearly 2 million are the children of immigrants. That means that at least 2 million people who personally understand the challenges and fears of having an immigrant parent will become part of the electorate in 2016. Over the course of the next five presidential elections, today’s citizen children of undocumented parents will have been able to cast nearly 11 million ballots. The intimate understanding of the immigrant experience is felt broadly in the Latino and immigrant communities: 16.6 million people have a family member who is undocumented, and nearly 60 percent of Latino registered voters of all ages said they knew family, friends, co-workers, or others who were undocumented. As The White House Task Force on New Americans—an interagency effort focusing on immigrant integration into American communities—describes, USCIS adds approximately 700,000 naturalized citizens each year to the 19.3 million who were already living in the United States as of 2013, all of whom are eligible voters. Notably, naturalized immigrants and children of immigrants are more likely to vote than third-generation immigrants. These voters and voters-to-be overwhelmingly support DAPA. Polls find that 89 percent of Latinos support these deferred actions. Additionally, 65 percent of Asian Americans polled in 11 states support executive actions on immigration. And support is not just limited to Latinos and Asian Americans: Americans favor the DAPA policy by a 76 percent to 19 percent margin. DAPA provides tremendous benefits to both American communities and the country as a whole through the substantial fiscal and economic contributions resulting from its implementation. Political opposition and support of DAPA is also important to large and growing demographics and key voters. Those opposing implementation should consider the economic benefits, as well as voters’ support of DAPA. In particular, presidential candidates in the 2016 election should clearly articulate their positions regarding the executive branch’s authority and, should they win, their decision whether to implement DAPA. Moreover, even though DAPA would cover millions of people, millions more would remain unprotected from deportation: The U.S. Department of Homeland Security should grant deferred action to additional undocumented individuals in order to bolster the economy and administer a policy that is dear to so many. Lizet Ocampo is Associate Director of Immigration Policy at the Center for American Progress. The author would like to thank Marshall Fitz and Philip E. Wolgin for their input and Silva Mathema for the economic analysis.